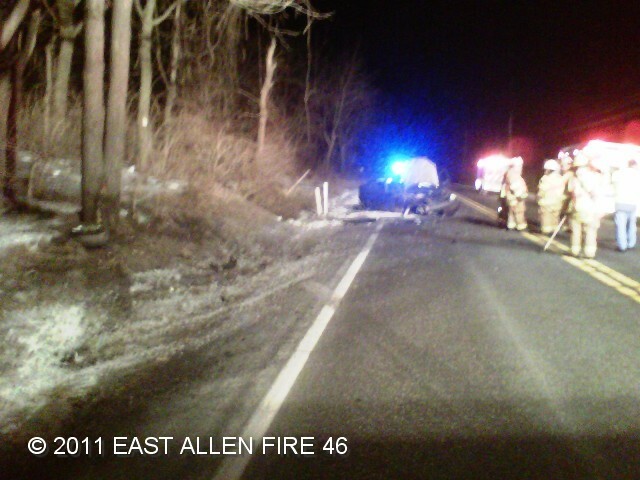 Structure Fire on Walnut St.
On Wednesday, December 28, 2011, - At 18:15 hours, EAFD was dispatched to an MVA with rollover and entrapment. Chief 4651 arrived on scene and took command. Crews from Rescue 4641 established a full Hurst setup and portable lighting. 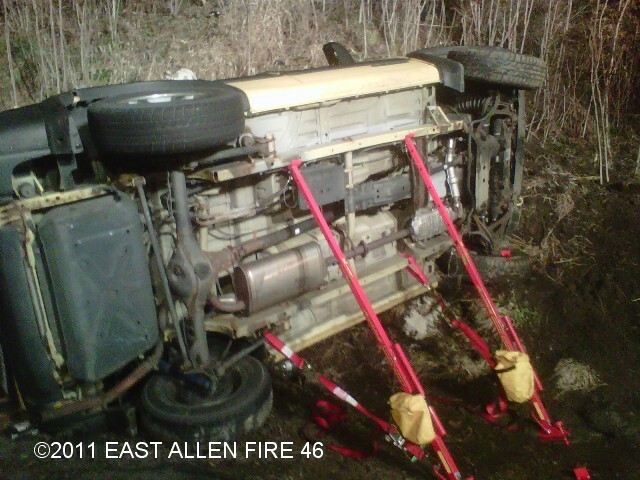 Crews stabilized the vehicle and removed the windshield and cut the 4 posts on the passenger side of the vehicle. Crews from Engine 4611 pulled a 1 3/4" hand line. The units cleared the scene within 1 hour 30 min. 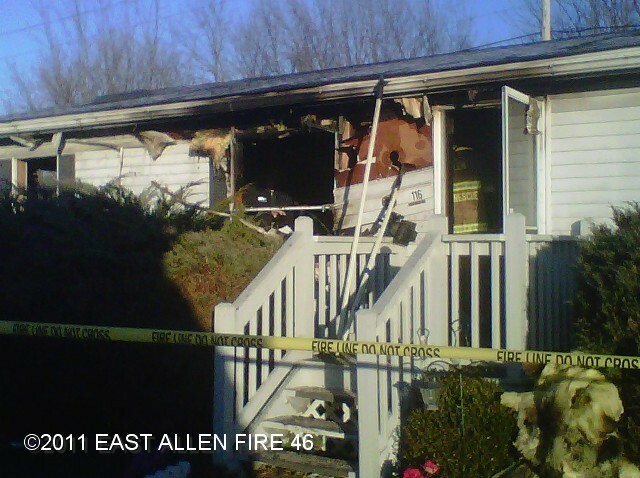 On Sunday, December 11, 2011, - At 05:01 hours, EAFD was dispatched to a Dwelling Fire in Greenbriar Village. Chief 4651 arrived on scene and took command. Crews from Engine 4611 stretched a 1 3/4" attack line and made a quick knock down within 15-20 minutes. Crews from Ladder 4621 provided the water supply and assisted the crews from Engine 4611. The units cleared the scene within 2 hours. The fire is under investigation. 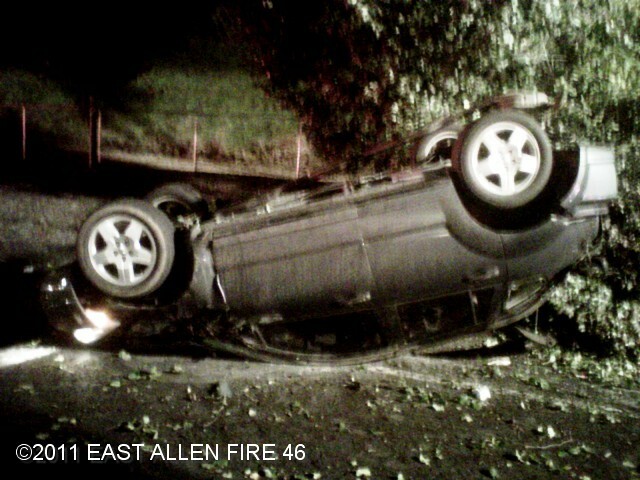 On Saturday, November 5, 2011, - At 02:19 hours, EAFD was dispatched to an MVA with injuries, a vehicle was rollover. 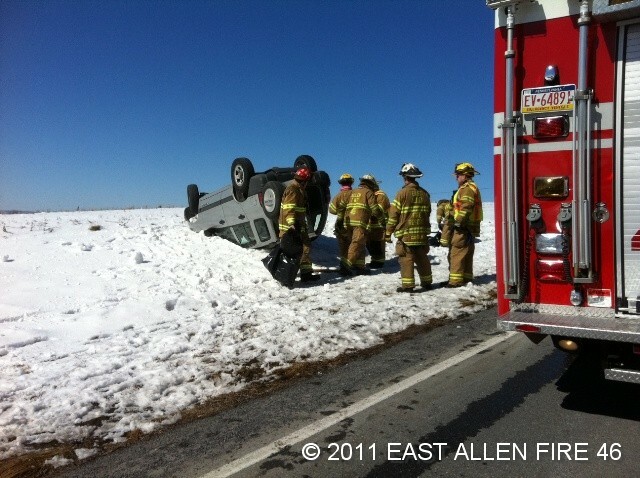 EMS 46 and PSP on scene reported both patients were out of the vehicle. Chief 4651 arrived on scene and took command. Crews from Rescue 4641 and Engine 4611 provided cleanup. The units cleared the scene within 1 hour. 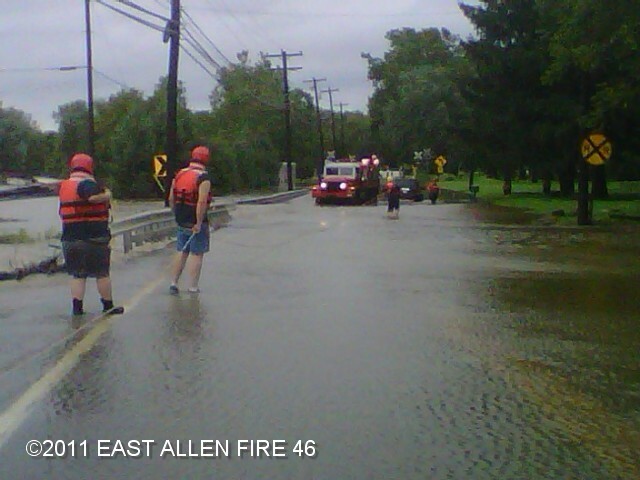 On Sunday, August 28, 2011, - At 9:09 hours, EAFD was dispatched for a water rescue on Beth-Bath Pike. Fire Chief 4651 arrived on location and took command. A vehicle went in 3 feet of water and the driver was still in the vehicle. Water Rescue 42 (Northampton) was dispatched to the scene. Crews from 4647 picked the driver up. Crews from Water Rescue 42 used a rope line to access the vehicle. The units cleared the scene within 1 1/2 hours. Just a footnote to this event and many more like it. When you enter flooded areas, you not only place your self in danger, but you also place our first responders in danger to get you out. Please heed the signs and barricades. 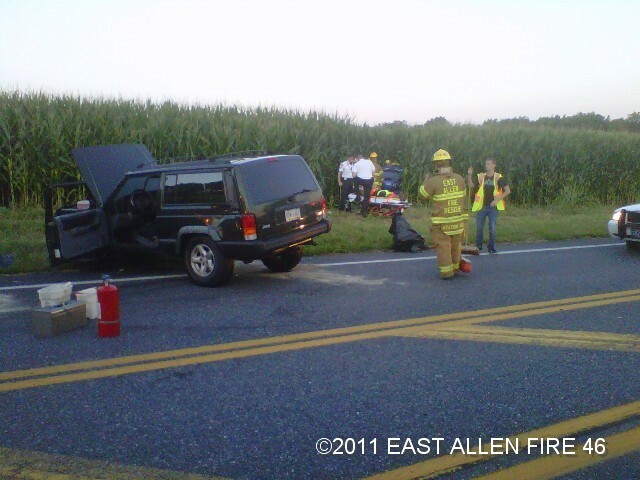 On Wednesday, August 17, 2011, - At 19:26 hours, EAFD was dispatched for fire police to assist State Police with a none injury accident on Airport Road. EMS 46 arrived on scene and reported that they had two injuries. EMS 46 requested Medic 49 and Fire 46 for a full response. Fire Chief 4651 arrived on location and took command. Crews from 4641 and 4642 performed battery disconnects on both vehicles and provided spill control. The units cleared the scene within 1 hour. 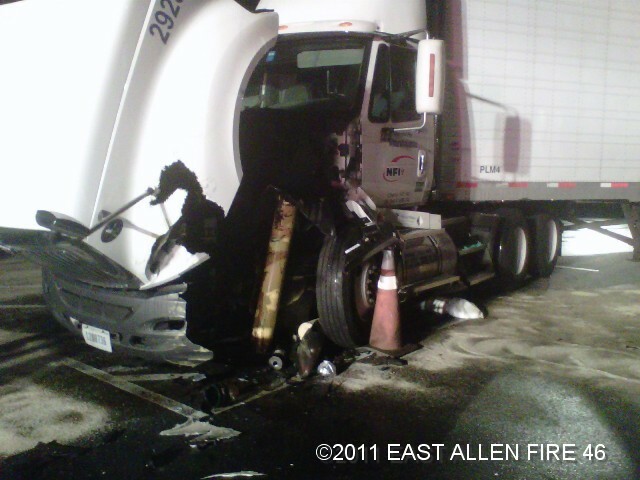 On Thursday, August 4, 2011, - At 00:24 hours, EAFD was dispatched for a diesel fuel spill on Silver Crest Rd. Fire Chief 4651 arrived on location and took command. The units cleared the scene within 4 hours. Special thanks to Trexlertown FD for staging Tanker/Pumper 2521 at Station 46 while our tender was committed. MVA at Nor-Bath Blvd. and Driftwood Rd. We recently learned of the passing of former Fire Captain and past Fire Dept. President Scott Beard. Scott died unexpectedly at his home in Myerstown at the age of 49 on July 11. He left a widow and 5 children. Our prayers and sympathies go out to his family. On Friday, July 15, 2011, - At 11;45 hours, EAFD was dispatched for Ladder 4621 for move up to Hecktown Station 53 to cover for a structure fire in Palmer Twp. Later Ladder 4621 was moved to the fire scene. The crew from Ladder 4621 assisted with fire extinguishment. Later into the fire the Tender (tanker) Task Force was dispatched, Tender 4631 responded to the scene. See more photos. Ladder 4621 assists Moore Twp. Police Dept. 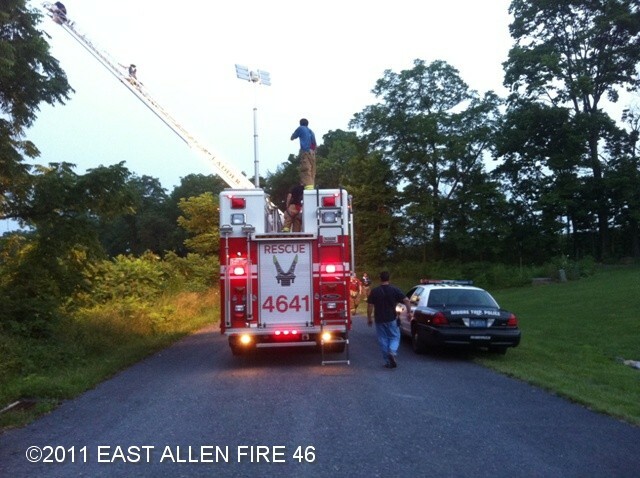 On Monday, July 11, 2011, - At 20;04 hours, EAFD was dispatched a Ladder 4621 requested for an aerial search. 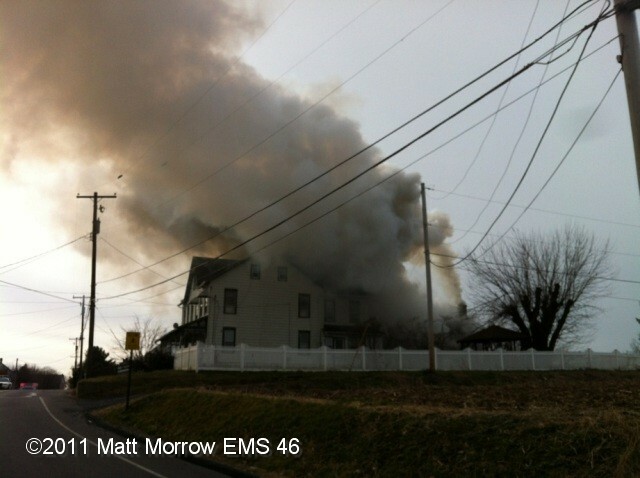 Ladder 4621 and Rescue 4641 assisted Moore Twp. Police Dept. The units cleared the scene within 1 hour. 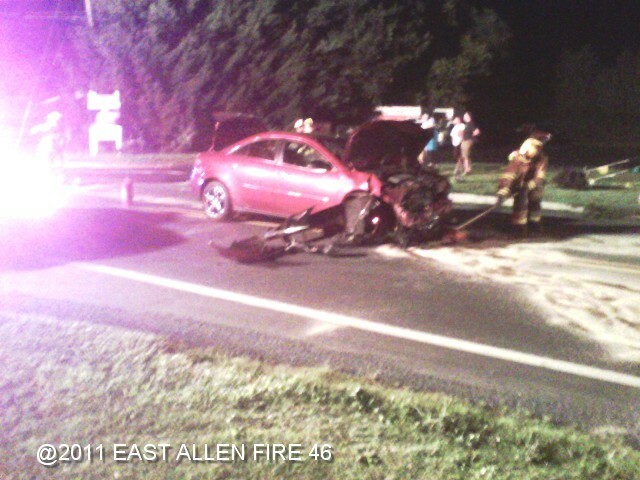 On Wednesday, July 6, 2011, - At 23:07 hours, EAFD was dispatched for a 2-vehicle accident with injuries. Chief 4651 arrived on scene and took command. Crews from Rescue 4641 arrived on scene and assisted EMS with patient care. Crews from QRV 4642 provided traffic control. The units cleared the scene within 1 hour. 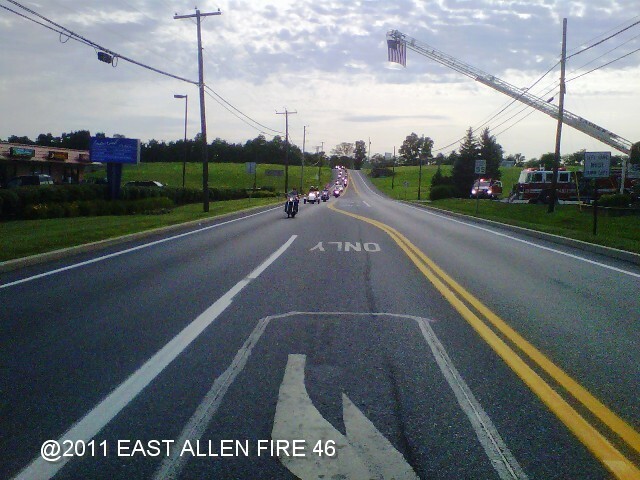 On Saturday, July 2, 2011, - At 17:30 hours, EAFD assisted with traffic control at Nor-Bath Blvd and Airport Rd. for a motorcycle run by Warriors Watch to welcome home Cpl. Troy Frantz, USMC, from his second tour in Afghanistan. See more information at http://www.warriorswatch.org/. 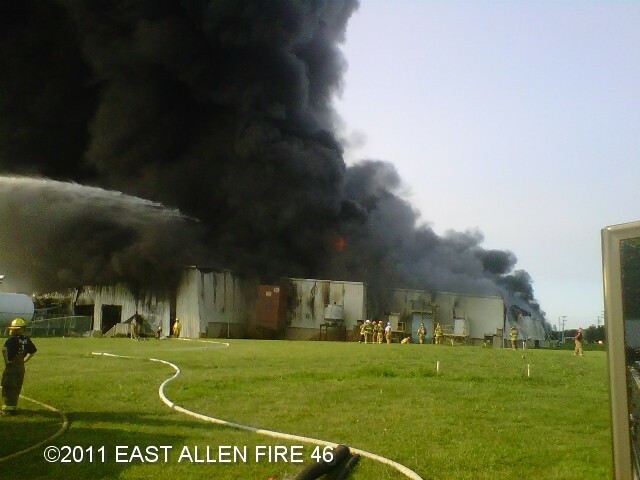 On Tuesday, June 21, 2011, - At 17:54 hours, EAFD was dispatched for a fire in a garage with Station 45 (Allen Township). Chief 4651 arrived on scene and report a working garage fire with heavy fire and smoke. Asst. Chief 4553 took a command. Crews from Engine 4512 arrived on scene and stretched 1 3/4 and 2 1/2 inch handlines. Crews from Engine 4611 and Ladder 4621 assisted with crews from Engine 4512. The fire was under control within 20 minutes. The units cleared the scene within 3 hours. See more photos. 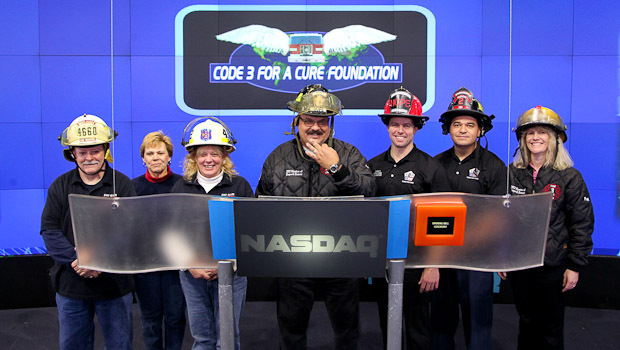 Code 3 for a Cure Foundation will kick off their 2011 Mission of Honor and Hope on March 14, 2011 and travel across the U.S. Please take a few minutes to visit the Code 3 for a Cure Foundation and www.celinedion.com websites, and support them if possible. They are scheduled to arrive at our station the evening of March 31, and stay with us for two days. Those of us who had the honor and privilege of getting to know Lorenzo during the 2010 mission, are looking forward to seeing him again. 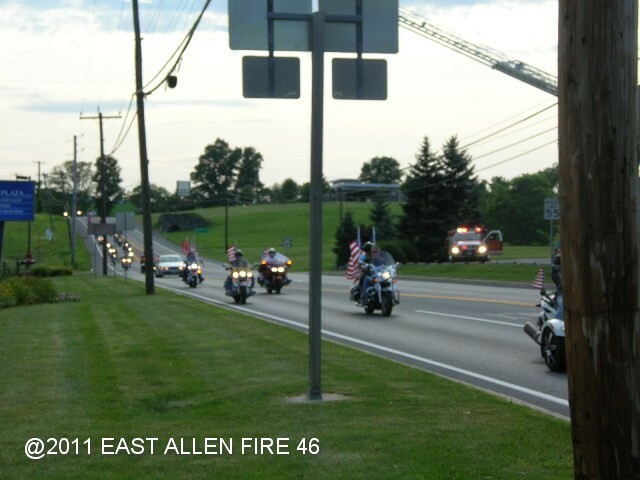 The members of the East Allen Township Volunteer Fire Department, located at 5354 Nor-Bath Blvd. (Route 329) in East Allen Township, will be welcoming the members of the Code 3 For A Cure Foundation to our Fire Station on Friday April 1 at 10:00 AM. 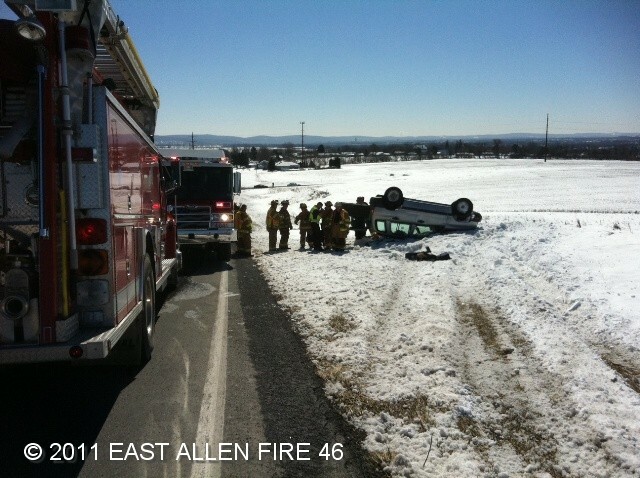 On Tuesday, February 22, 2011, - At 12:07 hours, EAFD was dispatched, along with Fire 45, for an MVA with rollover and entrapment. Fire Marshal 4660 arrived on scene and initially took command. Crews from Rescue 4641and Engines 4511and 4611removed patient from vehicle, and assisted the EMS crews. The units cleared the scene within 1 hour. 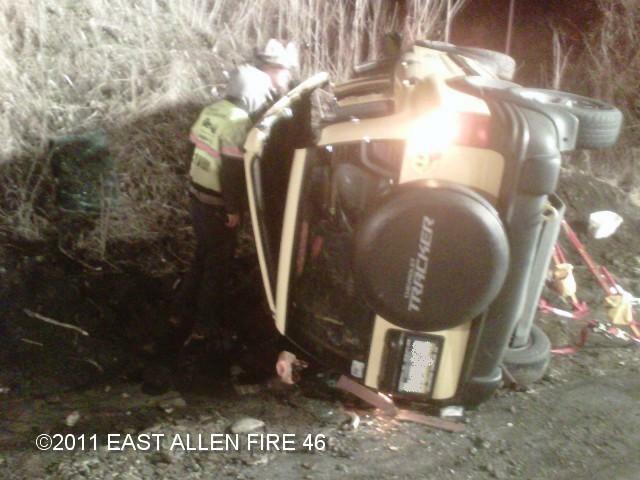 On Sunday, February 6, 2011, - At 21:57 hours, EAFD was dispatched for an MVA with injuries. Fire Chief 4651 arrived on scene and took command. The incident involved a single vehicle. Route 329 was closed between Jacksonville Road and Airport Road. The units cleared the scene within 1 hour.